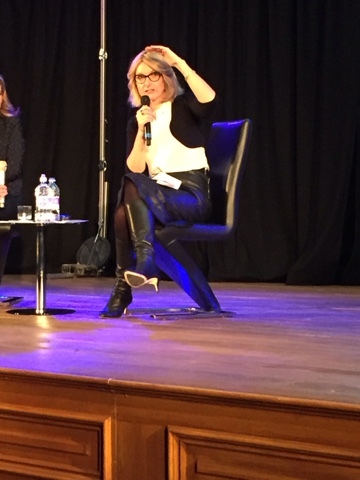 I promised a report on the talk I attended in London by Elizabeth Gilbert. She was being interviewed about her latest book, Big Magic. She believes that ideas have their own consciousness and are waiting for the right partner to bring them into the world. – This ties in with the feeling I often have when I’m writing that the story is being downloaded from somewhere beyond myself. Keep one foot in the real world and one with the fairies so that you push the boundaries and explore ideas that other people say won’t work. It’s fine if people have a contrary opinion to yourself, but exercise caution when reading reviews of your work. Don’t expose yourself to hatred and maliciousness. Reading reviews can be like eating a sandwich with broken glass in it. Be wary of showing your work to others in the early stages in case negative opinion kills the idea stone dead. Creativity doesn’t have to be for anything apart from you feeling like exploring it. It doesn’t have to be serious. Lose your distrust of pleasure and save guilt for when you’ve done something really wrong. Write an idea in different ways, play with it and liberate it from format. Elizabeth Gilbert wrote her best selling novel, Eat, Pray, Love when she was depressed. She believes that depression, anxiety and despair can be an invitation for creative thinking. Experiment until you find the doorway. Examine yourself and your life until you find something right, cells of light, then add to these..
Write a letter to your fear. If you want to be creative you have to make room for it, start saying no and give things up to find the space. Get real about the limits of your time and energy. 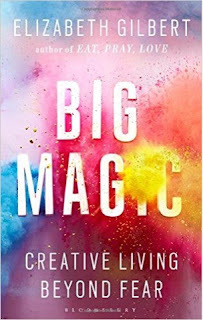 I found the question and answer session inspiring and reading Big Magic kept me going when I was flagging with my edits. A recommended read. Merry Christmas and best wishes for a fantastic 2016! Me too! Think the idea is not to restrain your creativity by known things and convention, but to let your ideas fly. I really like this thinking and mean to practice more of it. Happy New Year, Gwen.